One of our big goals for 2018 is to focus on our monthly spending. The last few years have been a big transition for us, so we'd been quite lax, errr....lazy, in regards to our spending once we got back to a 2 income household. 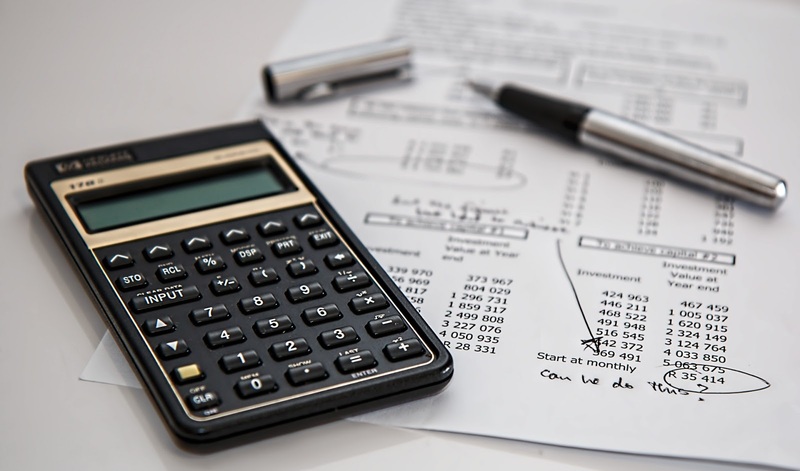 Reducing expenses is an immediate boost to our cash flow which in turn will allow us to pay down our debt and eventually get back to investing on a regular basis to build up our passive cash flow via dividend growth investing. Well so far so good with the inaugural Budget Check. Total income for the month amounted to $10,588.69 with total expenses coming in at $3,582.11. That leaves just over $7,000 of net savings and puts the savings rate at 66%. Not bad if I do say so myself. Especially since there was an unexpected $800 bill to fix the fuel pump on my car. 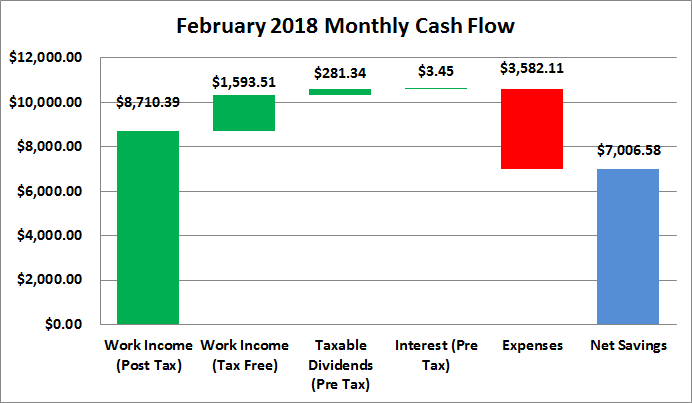 Income was overstated a bit for February as I was owed extra income that was earned throughout 2017 and was finally paid out. That was ~$2,100 of pre-tax income which would have come out to ~$1,260 post tax income that was overstated for February compared to where it is likely to be going forward. Truly passive income, dividends and interest, totaled $284.79 during February which was about a $21 increase from November 2017. *Dividends are from my taxable accounts only. Based on February's spending the passive income for February covered 8.0% of expenses. Thus far in 2018 I've totaled $563.80 from income outside of a traditional day job. There's still a lot of work to be done the rest of this year especially with regards to reducing our debt. However, February was a positive sign of what could potentially happen over the coming months. I know there's around $24k of debt that needs to be paid off and my hope is that by the middle of the year it's pretty much entirely wiped out. While February was a good start with a huge amount of positive cash flow, we're not quite ready to take that cash and throw it at the debt. I want to build up a small cash buffer first and of course we need to take care of taxes, we should get a refund but it's better to have the cash on hand and not need it than need it and not have it, so until April this cash will just sit on the sidelines. How is your monthly cash flow situation? Do you have any expenses that you could easily cut down such as your car or homeowners insurance? The insurance is crazy. Amidst all this shopping for new insurance and the low hanging fruit I couldn't believe how much our insurance has gone up since we got it a few years ago. And that's with no claims for homeowners or auto and no speeding/tickets.... We'll definitely be changing our insurance provider and next week should be a good time to take care of all sorts of fun things like taxes, insurance changes and who knows what else. Very cool report JC. You are certainly killing it on the income front. I am curious, have you considered maxing out the 401 (k) to minimize current taxes? Glad you enjoyed it and I think I'm going to make this a regular monthly post. Or at least more often than not. The income for February was excellent, but it was overstated a little bit due to the back pay that was owed to me and finally paid out. Although most months should see total income in the area of $5-7k so I can't complain too much. Once we get the debt taken care of I fully intend to boost up my 401k withholding to get the tax break. Right now though cash in our control is more important so I'm doing just enough to get the full match because I'm not going to pass on free money. Its great to see that your working to pay down your debt. It always adds some security when you have plenty of cash on the sidelines. Thats a nice savings rate. Keep up the good work! Getting rid of our non-mortgage debt is our big goal for this year. Not only will it get it out of our lives but it also will free up cash flow each month to use for other things which will really help to build up our savings and eventually our investment portfolio once again.